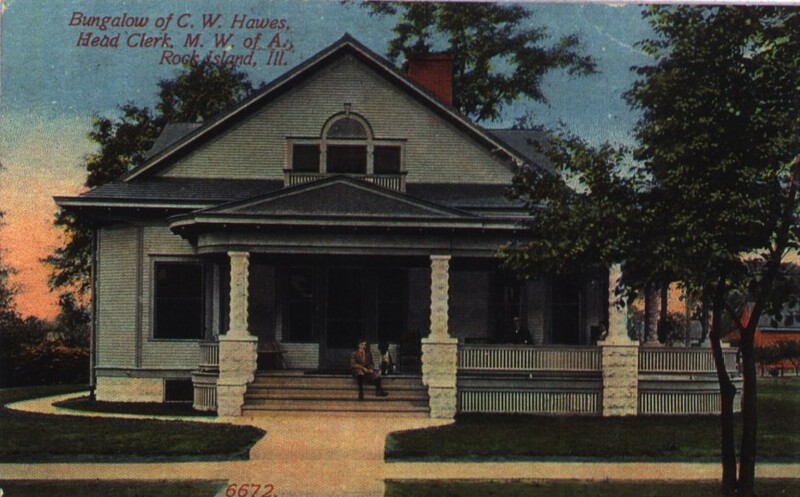 This Rock Island postcard, from the collection at the Rock Island Public Library, shows a house with the printed identification: “Bungalow of Charles W. Hawes, Head Clerk of M. W. of A.” Fortunately, this charming home still graces our town and still looks very much like it did a century years ago. The young man on the steps with the dog is probably his son, John, while Major Hawes and his wife, Mary, are seated on the porch. The dog’s name is not recorded. Major Hawes, who earned his title during the Civil War as a member of the 92nd U. S. Cavalry, was born in 1841, the son of pioneer Rock Island settlers. In 87, at age 46, he was said to be the oldest native inhabitant of Rock Island. After the war, he served Rock Island as Chief of Police and later as postmaster. He joined a Modern Woodmen of America camp in 1885, only two years after MWA was organized. In 1890, he was elected Head Clerk. Head Clerk is equivalent to the office now known as National Secretary. Major Hawes was a man of remarkable abilities, who greatly influenced and facilitated the move of MWA headquarters from Fulton, Illinois, to Rock Island in 1897. Later he was instrumental in establishing the Royal Neighbors of America as a true beneficiary auxiliary and not just a social group. He remained with MWA until 1914, when he retired due to ill health. Early in the 20th Century, Mr. Hawes and his family resided at 1216 21st Street and, for a few years, maintained what they called a summer residence at 1733 29th Street. By 1912, the family moved to their summer area permanently when they built the postcard home at 2900 18th Avenue. According to a sketch of the area dated 1913 and offered on Ebay in 2013, that homesite was known as Hill Top Place. Hawes died in 1916, only a few years after moving here but his wife remained until the mid 1940s. After her death, the home was sold and converted to a duplex. Meanwhhile, the Hawes’ previously residential neighborhood on 18th Avenue was changing. By 1953, a Chicken Delight restaurant had opened next door, and other businesses were locating nearby. Its proximity to a prime commercial corner made the demise of the Hawes bungalow only a matter of time. Within a few years, a brand new gas station stood on the home site. Today even the gas station is gone and the lot is part of the HyVee parking area. But the Hawes family home can still be seen. Fortunately, it was not demolished, but rather moved to a new location at 1418 20th Street in the Broadway Historic District. It is very recognizable, despite a few changes over the years. The postcard shows a porch that extends around the right side of the house. When the house was moved, the side portion of the porch was eliminated, which explains the reason for a curved railing on today’s south side and a flat one on the north. Fortunately the rustic masonry columns were saved. Over ensuing years, modern siding has been applied, narrow like the original, and the small balcony railing has been removed. Although the postcard calls this a bungalow, it shows many characteristics of other styles as well. Modern references to bungalows usually mean either a Craftsman or Tudor bungalow. The Craftsman is characterized by wide eaves and triangular roof braces while the Tudor has half-timbering and is usually constructed of masonry. The bungalow features in the Hawes house are the rustic porch columns and the fact that it is a 1½ story building. If it contained two stories, it would look a great deal like many of the other homes in the Broadway area that combine Queen Anne and Colonial Revival features. The multi-gabled roofline is Queen Anne, while the Palladian triple window, trimmed with a wooden keystone, on the second floor and the porch balustrade are Colonial Revival. Take a drive or walk down 20th Street to see Major Hawes’ house. If you’d like to know more about other homes in the area, be sure to pick up a free copy of the Broadway Historic District Walking Tour booklet at the Preservation Commission kiosk at Rock Island’s downtown library. This article by Diane Oestreich is slightly modified from the original, which appeared in the Rock Island Argus and Moline Dispatch on July 8, 2001.